The newest!!! Cowlifornia Swing, available in advance of the national release!!! Check it out...! 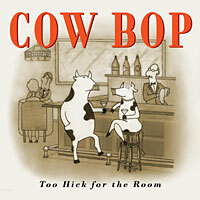 Too Hick for the Room, Cow Bop's third release!!! 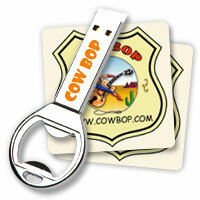 We are also selling "Official Cow Bop Party Packs" which contain a 1GB flash drive/bottle opener loaded with our your favorite Cow Bop CD, and two coasters. "The new way to deliver music, makes Napster look old school!" They can be ordered by sending $22 ($20 + $2 s & h) to 305 E Laurel Ave, Sierra Madre, CA, 91024 Any additonal or future CDs can be loaded for or only $5.00! 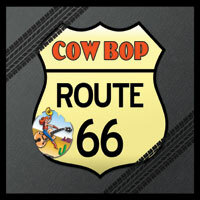 Route 66 - The second CD from Cow Bop! 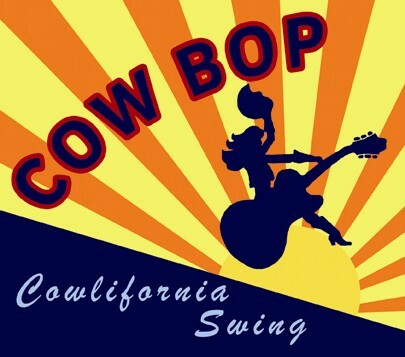 Swingin' Out West - The Debut CD from Cow Bop! Here it is! The debut release from Cow Bop. 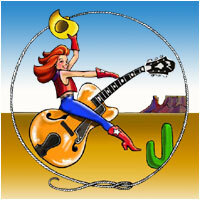 The BEST in Cowboy Jazz! Featuring classics from the golden era of Swing! Throw caution to the dusty desert wind and buy it today!